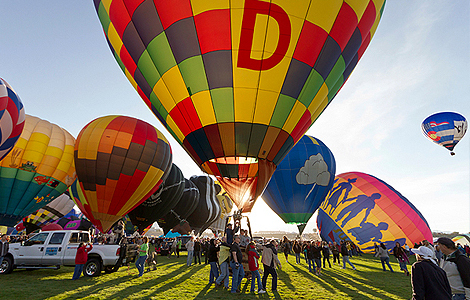 All eyes will be on the skies over New Mexico's largest city October 6-14 for the 41st Albuquerque International Balloon Fiesta. More than 600 hot air balloons are expected to lift off in mass ascensions from launch fields spanning the equivalent of 54 football fields. This fall also marks the final chance to join in New Mexico's yearlong 100th birthday celebration. Special statehood centennial events include "Dinosaur Century: 100 Years of Discovery in New Mexico" at the New Mexico Museum of Natural History and Science. In October, the exhibit focuses on some of the state's earliest and largest residents�giant dinosaurs. Visit: www.balloonfiesta.com. Picture the sweet sight of your child kissing the family dog before leaving for school. There are as many germs on paws that can make children ill as there are on hands. Your family dog shares more then affection with members of the household. Dogs, like people, are carriers of millions of germs. Fortunately the great majority of the bacteria is absolutely harmless. However, dogs carry and transfer human germs including, but not limited to; E. coli, Salmonella and MRSA (Methicillin-resistant Staphylococcus aureus). These dangerously harmful germs are passed between human and dog, back to human through licks, kisses and pets from their fur, face or paws. On August 20, the nationwide official back-to-school date, it is more important than ever to make certain your child doesn't innocently spread these contagions to their school mates. Thanks to PAWtizer�, kids can love their dogs while parents protect their family from dangerous germs and bacteria. PAWtizer� is the first ever alcohol-free antibacterial wipe and spray that is safe for pets and people but kills 99.9% of these wellness threatening germs on contact. All it takes is one quick wipe or spray to make your four paw'd family member as germ and bacteria free as everyone who washes their hands. Using PAWtizer will also clean your hands as effectively as other hand cleansers that contain alcohol without drying out your skin. The Annie's folks have come up with a great new organic pasta dish that little kids and big kids will love. CHEESY TACO Shells & Cheddar with Taco Seasoning Macaroni & Cheese. This is a perfect quick lunch or dinner item to enjoy with chicken or beef tostadas or alone. Visit: Annies.com For great new ideas for school menus.